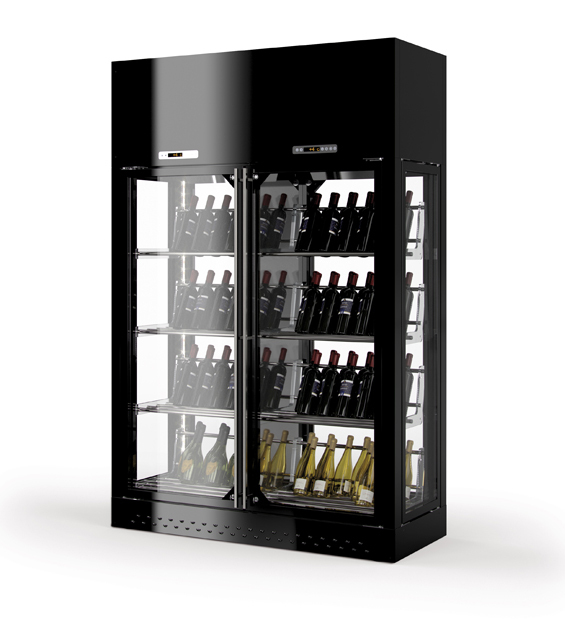 The Wine Library model is designed to create the most attractive wine bottle display in any room. 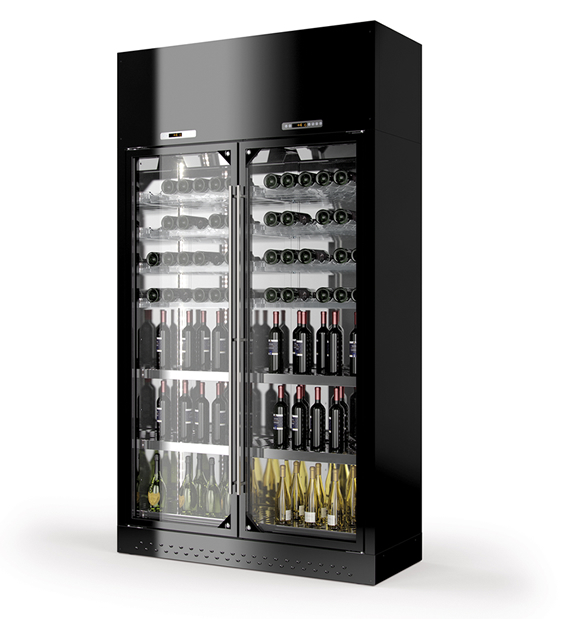 The height of the doors, combined with outstanding LED lighting and mirrored internal walls, provide an elegant and refined frame for wine bottles. With the Wine Library, bottled wine becomes a beautiful focal point in the room, capturing everyone’s attention. 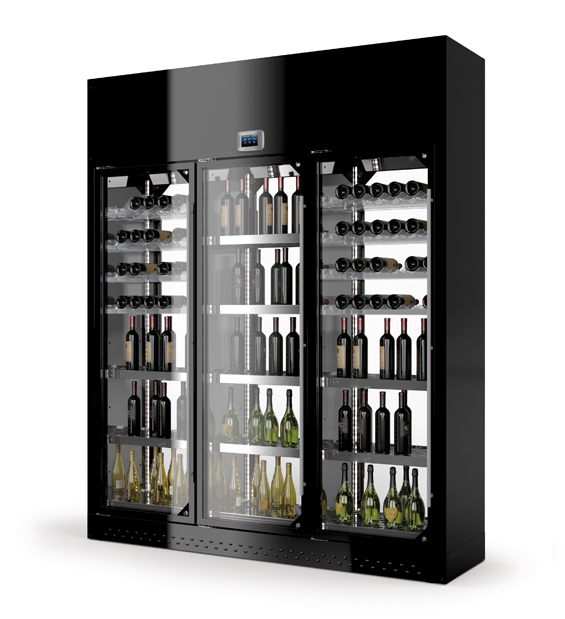 The Wine Library can be equipped with a humidity control system. Customers can also combine multiple units to create separating walls in large rooms, while also ensuring visual continuity of the room with the front/rear doors of the product. It is also possible to install the Wine Library on a wall, by simply allowing sufficient ventilation. This one-door version features a mirrored, closed back wall, forming a storage wall for wine and other products. The Wine Library’s door is made of 20mm thick, low emission, double-glazing glass, which is embedded in a frame with magnetic gaskets. The body of the unit is made of a 50mm thick insulating panel. The arrangement of bottles in the compartment is entirely adjustable, with steel tubes to display bottles horizontally or oblique, steel or plexiglas perforated shelves for vertical displays, elegant plexiglas moulded supports to hold bottles in a horizontal position or even special multi-position metal supports. All customers can find a solution that best suits their needs with the variety of size options available in the Wine Library. There are one, two or three door models as well as height options from 260 cm or 220 cm. With LED lighting, 50mm thick insulation, a 20mm thick low emissions, double-glazing glass door and a control system which improves the efficiency of the refrigeration equipment, energy consumption is quite low in this unit. As an option, you can control and maintain the humidity level above 50%, in order to create the perfect storage environment for bottle corks and labels. 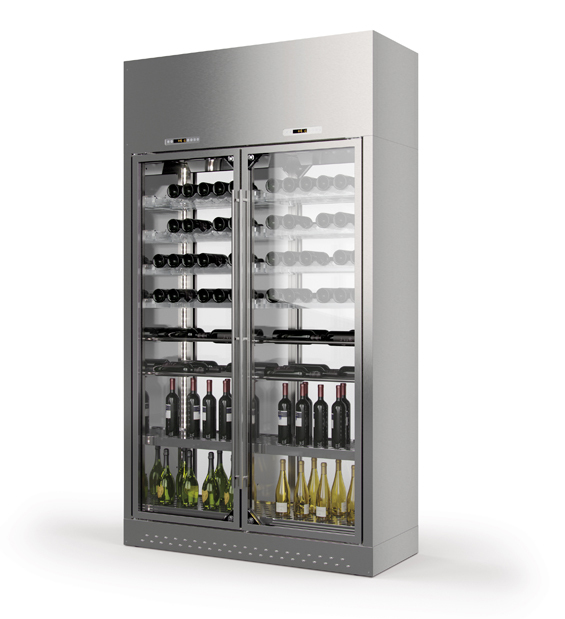 Sleek, clean lines, transparent bottle racks, mirrored internal walls, stainless steel handles, and modern, laminated wood create an elegant and refined frame to showcase wine bottles. Two height options and one, two or three door models are available. Each unit is equipped with a stand-alone temperature and humidity (optional) control kit for the refrigerated compartment. Front/rear doors or a closed back well are also options, along with internal mirrored laminate. The wood laminate body is available in both semi-glossy black and brushed aluminium grey. Other colour options are available upon request. The unit’s door frames are made of anodized aluminium in silver or black. Other colour options are available upon request. The Wine Library’s wide display area features LED lights along the perimeter of the door as well as mirrored internal walls, creating a striking effect for the ultimate bottle display with a 360º view effect. Through the USB port of the controller it is possible to upgrade the machine, download the list of HACCP alarms and configure the parameters of the unit. 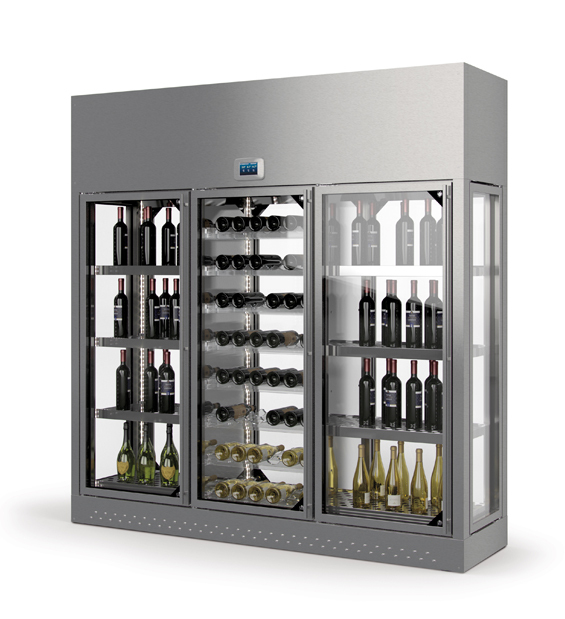 The innovative, ventilated refrigeration system in the Wine Library maintains the correct temperature without using an evaporator and consequently gaining interior space. The temperature settings in this unit range from 4ºC to 20ºC, which can be set easily by the operator for each module.